By Leonardo’s time, the study of the life model was standard practice in the Renaissance artist’s workshop. The movements of the face and hands were particularly important as a means of conveying a person’s feelings. Leonardo has obviously studied these elements intensely before beginning this painting. In the foreground, a writhing mass of figures surrounds the Madonna and Child. 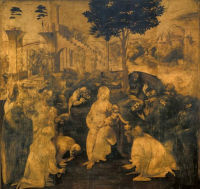 Leonardo has portrayed these “extras” in an astonishing variety of movements and gestures so that each conveys their own unique response to the arrival of God’s son on earth – wonder, awe, curiosity or disbelief. Their varied emotions cause them to move in different directions, as their heads turn this way and that. Despite this chaos, the attention of most is firmly focused on the Mother and her infant, who are calmly seated in the centre of the heaving crowd. The peculiar individuality, range and expressive force of Leonardo’s figures supersedes anything produced by his contemporaries. In this unfinished painting, Leonardo has combined the power of his imagination with his knowledge of natural forms, to create a new and powerfully expressive type of art. If the painter wishes to see beauties which will enamour him, he is the lord of their production, and if he wishes to see monstrous things which frighten or those which are buffoonish and laughable or truly compassionate, he is their lord and god.